Just as with our previous Dashboard, you can use it to quickly search, categorize, keyword, and launch your own actions too (or any action in your action palette). 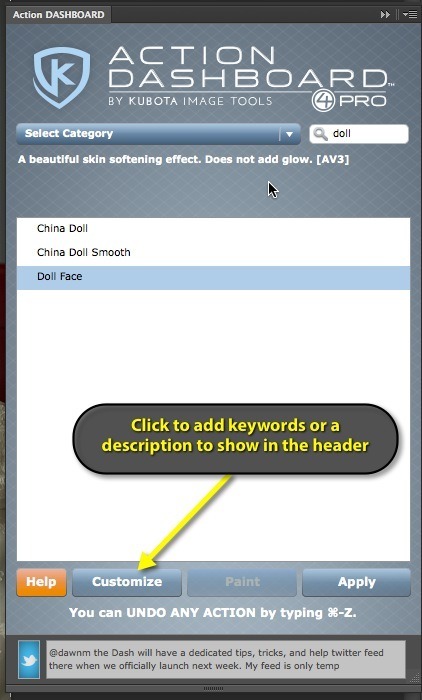 The Dashboard is a great workflow tool for any action user. Our previous Dashboard would automatically load all user actions at startup. Our new Dashboard requires a simple click to read them. We could set this up to happen at login or from a button on the Dashboard itself. Give us your feedback! Do you like keeping it cleaner to start with or would you rather have them load by default? 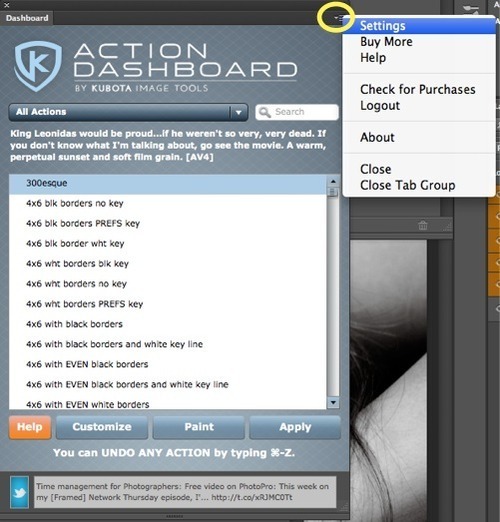 To load, open the settings menu and click “Import User Actions”. That’s it. Remember that if you add new actions to your actions palette, or change the names, you’ll need to reload them to let the Dashboard know of the changes. Currently, we don’t have a way to dynamically see any changes to your action palette. 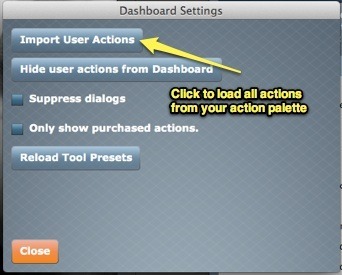 Bonus tip: If you don’t want to show an action or action set in your Dashboard, e.g. if you are working on testing a new action and don’t want it on the Dashboard yet, you can put a tilde character in front of the action name or the action set name, like this: ~My Test Action. If you put it in front of a set name, none of the actions in that set will show in the Dashboard. Remember to “Import User Actions” again if you make these changes to the names!